Last week–maybe the week before as well (but this last week for sure) I was greeted with a pleasant surprise in an ad. Most advertising is frustrating, deceptive, or otherwise just bugs the sheer heck outta me. This was one of THE BEST ads I can think of in a number of YEARS. See…THIS ad prompted me to ACTION. It informed me of this two-day event. Reminded me that this was happening, as I believe I’d seen SOMEthing about it some time back. And it was well-timed, being the Wednesday before the event–providing me with several days to consider and make plans and actually attend the event! The Death of Superman came out last July or so, and I enjoyed it overall. 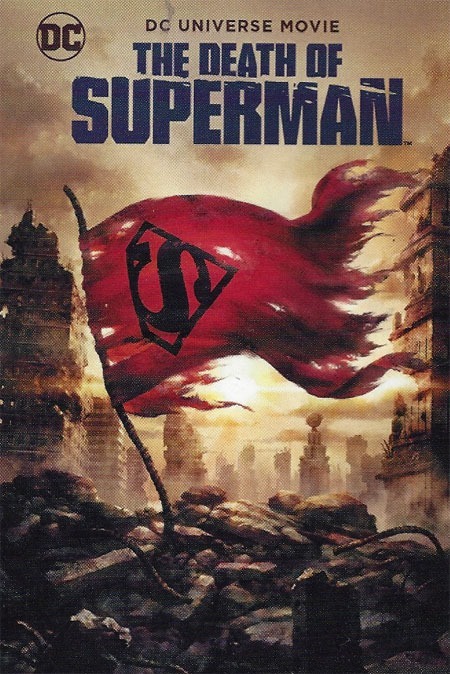 It was certainly far superior to 2007’s Superman: Doomsday (which I still hold as primarily worthwhile for its retrospective documentary on the actual comics event). This "do-over" was good, catching a number of good points from the original comics…while updating, modifying, and adjusting stuff in such a way as to fit it–essentially–into the New 52 continuity, as the last few years of these DC Universe Movie features have been–some based directly on those comics, others drawing inspiration from, and so on. For me, probably the most stand-out thing about this The Death of Superman was the way it pulled off addressing Lex Luthor as he’s generally been known, and yet the Luthor at the time in the comics was vastly different. I remember that moment in here leaving me chuckling–like "Alright, I was wondering, and that’s good, I like that, that’s awesome!" In its Return of the King style multiple "epilogues," it also drew from what I feel is one of THE absolute KEY moments of Funeral for a Friend/World Without a Superman, the heart of that story, and in some ways maybe the entire reason one could do this sort of story. It gives us a voiceover of Bibbo praying, talking to God, asking how it is that He would take Superman…while a washed up old roughneck like him goes on living. It was a scene in the comics that made me cry in 1993, it’s a scene that has brought tears to my eyes multiple times since in re-reading the comics, and darned if it didn’t have my eyes wet in the theater the other day! 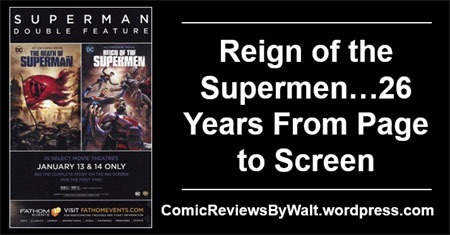 The biggest draw here for ME, of this double-feature, though, was Reign of the Supermen. Not only the chance to see these on "the big screen," but the fact that it was a chance to see this one a couple days BEFORE the "digital-only" "window" that I so thoroughly DESPISE that has been such a trend lately/for years. I’m still trying to decide what I think of this one, and perhaps as I’m typing this I’ll better settle it out. Something that really stood out to me quite a bit was the way that the Justice League was involved, as well as the very presence AT ALL of Darkseid.That more than even just the costumes rooted this as a sort of New 52 version of The Death and Return of Superman stuff. It worked–having Doomsday be a weapon of Darkseid, and Darkseid having been behind Hank Henshaw, and all that. In context of Darkseid being THE big Justice League foe of the New 52 and all that; being the driving force of the "origin" of the League, etc. But it also turned this into a Justice League story in which Superman had died…rather than being fully at its heart a Superman story. While I can "appreciate" certain stuff with Darkseid and even like certain visual interpretations…on the whole I just do not care for the character and find the character to be vastly over-used and uninteresting. We still had key moments adapted into the film. 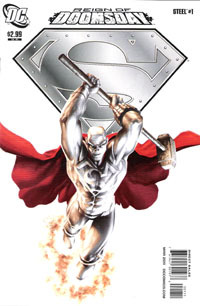 Steel still had a momentary subplot with weapons; Superboy hitting on women; the "visored Superman" still used deadly force; the Cyborg still saved the president and was recognized as the real, one, true Superman; and so on. Scenes had some clever nods to comic covers in montage mode that I really liked. 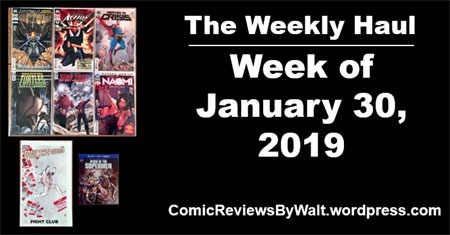 To "just anyone" it was a montage; someone like me that read the individual comics each week as the story originally unfolded across much of 1993, it was an excellent way to acknowledge the original comics without being hung up on them and their story. 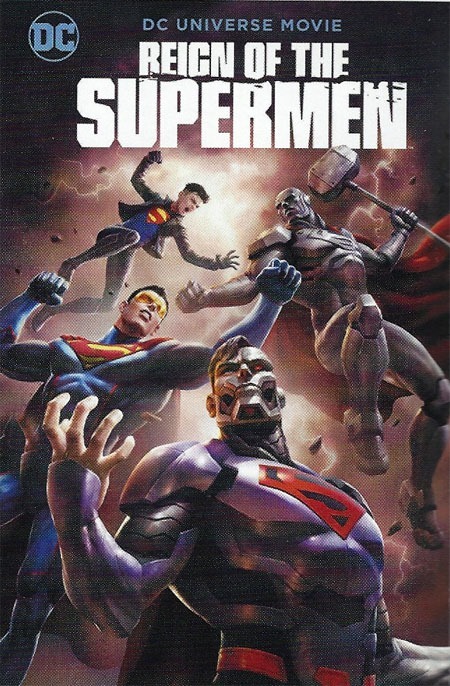 While Superman, the Supermen were a primary driving force…I just strongly feel that this could have been just as easily Justice League: Invasion II or some such. I’ve missed at least a couple other Fathom Events presentations of DC Universe movies. I’d been very interested in and planning on going to see the Batman: The Killing Joke back in 2016, but was laid off days before and still in a bit of "shock" over the whole situation, and didn’t go. And I’m pretty certain there was at least one other "premiere" in theaters in 2017 and/or 2018. But it feels "fitting" to see these…and all the better a value for having both together. I think the listing I saw indicated the combined thing was 2 hours 45 minutes or so–which makes for a "longer movie," with an individual 70-74 minute animated feature "short" and a "full length" film running closer to 120 minutes. But unlike most of these "longer movies" in theaters, having these as two movies but back to back…there was a whopping 5-minute "intermission," which was more than enough time to go to the restroom and grab a quick drink. I certainly wish more films would be a bit longer BUT (such as on a cliffhanger) have a brief intermission for using the restroom and such. 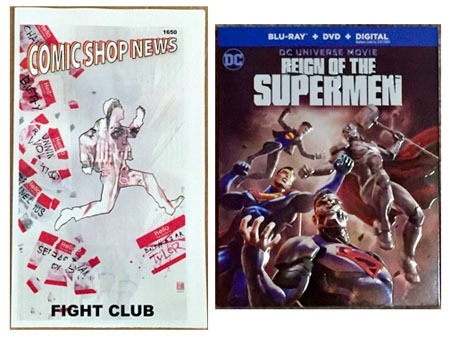 Even having bought and watched The Death of Superman last year, and even just having seen Reign of the Supermen in the theater…I’ll still be buying the latter in a couple weeks when it’s available. 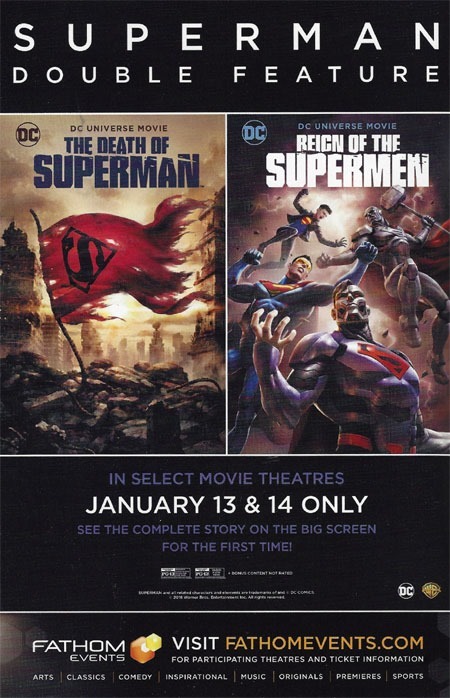 If you’ve bought/watched The Death of Superman this is a solid continuation. And even if you’re not really a Superman fan but dig Batman and the rest of the Justice League, this is also very much a Justice League thing, and fits with the other recent Justice League animated features, references the Teen Titans, and generally works in that continuity. It’s taken 26 years…from the original comics to this animated (double) feature. I’m glad to be able to have ’em, all the more as they make a 25+ year old story "new" and "current" again for an entirely new generation! Back in late 1992, possibly early 1993–VERY shortly after Superman #75 was published–a collected volume was rushed out, collecting the six Superman issues and the Justice League issue that made up the Doomsday! (now simply The Death of Superman) arc. I have always considered it something that was rushed because on the back where they gave a cover gallery, several of the issues were obviously-marked (Roman Numerals) later printings…whoever had been tasked with designing the back cover did not even themselves have access (or care) to all first-print editions (and I say this assuming there were no digital images floating around back then to simply access and use). And over 1993 we then got the Funeral for a Friend story collected as World Without a Superman, and then eventually a massive (even by contemporary standards!) The Return of Superman (my copy, bought at the time, was a whopping $14.95 or so..!). Over the years, those volumes have remained in-print…with the only major difference that I have noticed being that the Death of Superman volume eventually was switched to the iconic Superman #75 cover image of the tattered cape amidst the wreckage of Doomsday’s rampage. 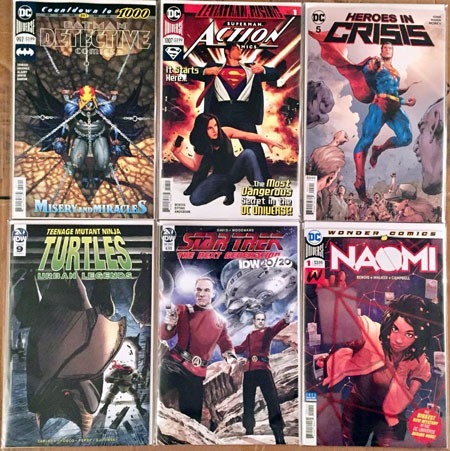 The volumes originated in a time where any such collected volume was a real rarity/novelty, and it was only the particularly “special” or truly “sold-out” major storylines that would get collected into a single-volume edition…and each was largely its own thing, existing as an isolated item. “Simple” as the spines were back then, my original editions, at least, look ok together, but do not match many “surrounding” volumes on the bookshelves…and other than “knowing” the three volumes belong together, there’s no real indicator of them, nor the order to read them in. I take such knowledge totally for granted, but especially in this day and age of constant deaths and resurrections and timey-wimey stuff and multiverses and pre-Flashpoints and New 52s…’nuff said. 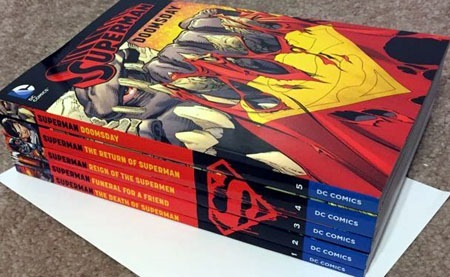 We now get five volumes–each more manageable than the Death and Return of Superman Omnibus, and admittedly higher prices…but also more content in the volumes–for example, the Death of Superman volume now contains the Newstime magazine that was published during all this; the Funeral for a Friend volume has the Legacy of Superman and the Supergirl/Team Luthor special; while what was formerly the single-volume The Return of Superman has been split in two–with the addition of the four ongoing titles’ Bloodlines annuals (each issue starring one of the Four Supermen) as well as the entirety of issues that had only had several pages reprinted. And while it does not fit the “set” or “series” quite the same way, we have the inclusion of the Doomsday volume, giving us the Doomsday: Year One annual as well as the complete Superman/Doomsday: Hunter/Prey along with Superman: The Doomsday Wars. I believe podcaster and fellow blogger Michael Bailey said it on Facebook (and I wholeheartedly agree!) that probably a better fit for this volume would have been the early-2000s mini-series Superman: Day of Doom in place of The Doomsday Wars. Still, all in all, I love the new trade dress–the black bar with red logo/title text contrasts nicely with the images, and really make them look like part of the same series of books. While I kinda question the wisdom of numbering the volumes (wondering if a 2 or 3 or 4 or 5 on the spine would put someone off from buying an isolated volume), I absolutely love that with the full set, part of the spines makes up a black box with the iconic (extremely so to me!) “bleeding S” that denotes the death of the Man of Steel. 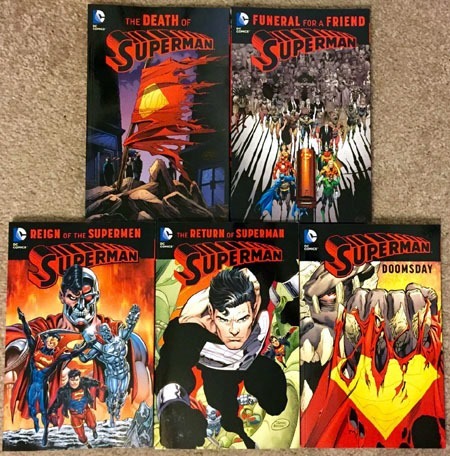 This set gives me at least my 5th edition of the Death of Superman volume, and I have many of the issues in this set multiple times over. Yet, given what the saga means to me, on learning of these new editions’ existence and the inclusion of the specials and particularly the annuals…I was immediately interested. That the spines do what they do put me over the fence. However, I did wait until these were available from InStockTrades, as I certainly was not going to buy all 5 at once at anything remotely approaching cover price, and even this was a hefty one-time amount to lay out. For saving 45%, though, I’m extremely pleased with the purchase, and having these volumes!